For smaller production volumes, fully automated depositors for producing candies, jellies, lollipops and toffees are an uneconomical proposition. However manual lines can suffer from a reduction in throughput speeds and a reduction in quality. A dedicated short-run depositing system as part of a manual line can deliver high quality, consistent product at a lower cost. The Baker Perkins Servoform Mini Depositor has been designed specifically for use in smaller-scale manual production lines or for use in product development. The Servoform Mini is a fully servo-driven depositor that’s designed to produce extremely smooth and high quality products with uniform size, shape and weight. The Servoform Mini has an operating capacity of approximately 54kg per hour. This equates to 10,800 5g sweets per hour or 5,400 10g lollipops per hour. Products can be produced with weight from 2g up to 16g. Moulds are manually loaded to a continuously indexed conveyor, filled, and then manually unloaded for cooling and demoulding. Advanced features include a heated hopper that can be expanded to incorporate two-colour or filled products and PLC controls with graphical representation and full recipe control. 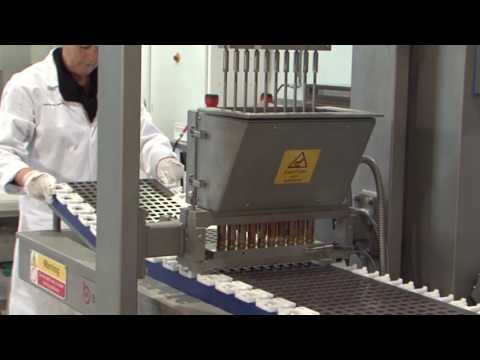 The Servoform Mini has been designed with high hygiene in mind, which means it can be used to validation standards in order to produce higher-value medicated or functional products.